Food enthusiasts that love to focus on plate presentation are in for a yummy pancake-based treat. 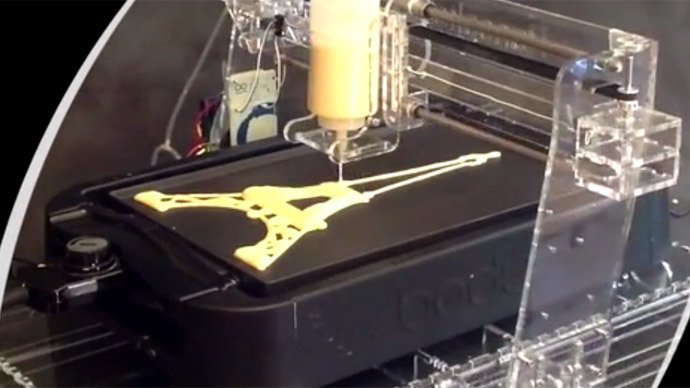 A new 3D printer can craft your imagination’s images into a hot griddled snack. The possibilities of the new technology are endless, all you need is a computer, an original design and a few hungry mouths to feed. The printer will endure any of your wild imagination’s demands. Once the design is traced on your computer, the so-called PancakeBot “prints” the image onto the griddle. The device consists of a bottle with batter, and a system that moves and squeezes it according to the design. The pancake dream machine is an invention of an American entrepreneur who loves his breakfast. Instead of developing a money printer, he opted to print one of America's top breakfast choices – the pancake. Valenzuela, an American who lives in Hokksund, west of Oslo, was determined to make a pancake machine from Lego for his two little daughters aged one and three at the time. Valenzuela, who in his day job works as a civil engineer, began developing various Lego designs and printed his first pancake after just six months of development. The response was so good, that Miguel designed a more advanced version, which in 2014 was exhibited at the San Mateo Maker Faire and the White House Maker Faire. The chef/robots are now on sale for just $179 through the Kickstarter website, which supports entrepreneurs in the IT sector. So far it has raised over $208,000 with 20 days to go. But be quick, because when it goes on sale in retail outlets in July its price will almost double to $300.